Texas Freckles: Can you believe it? I won! Can you believe it? I won! 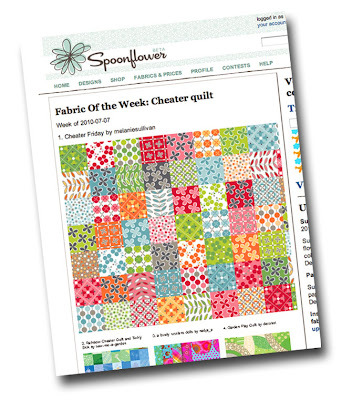 Thank you so much for your support in the Spoonflower fabric of the week contest! I'm so excited! I can't believe I actually won! For those of you who asked about purchasing the 'Cheater Friday' fabric, here's the lowdown. Before a designer can sell their fabric on Spoonflower, they are required to order the fabric to serve as a proof (in the textile industry, it's called a strike-off). 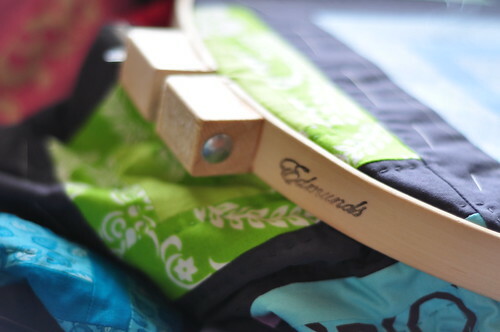 The designer should use the proof to ensure that the fabric prints as they intended and gives them the opportunity to make changes if necessary before the fabric is available for sale. Spoonflower's current lead time is about 20 days, so I wasn't able to get a proof prior to this fabric going on sale. Spoonflower is going to make the fabric available for sale today (before my proof ships) since I won the contest. If you buy the fabric from Spoonflower before I see the proof, be aware that I can't vouch for how it turns out since I haven't seen it yet. Stephen also sent me a message to let me know that he's having to rotate the design, and I think that's actually going to modify the repeat, so you may not receive all 56 squares in a FQ. I won't know for certain until I receive the proof. Once I see the proof, I am going to order some yardage of the fabric. I'll probably sell some FQs myself since I would actually profit more by selling the fabric myself and you could purchase the FQs for less if you buy it from me after I buy yardage. Image from Spoonflower's blog at www.blog.spoonflower.com. I'm still working on the Paintbox quilt when I steal a few minutes for myself. I'm really pleased with the way it's turning out and I love quilting with the perle cotton. I think I'm going to hand quilt the pinwheel sampler with perle cotton too. I received a couple of questions about my quilting frame and you can see above, I'm just using a quilting hoop. It's an Edmunds 14" quilting hoop which I purchased at my LQS. Quilting hoops differ from embroidery hoops in that they are much sturdier and the hoop is thicker (this one is 1" high or thick). I'd love to have a larger frame, but until we move and get settled, I'm going to stick with this small hoop and just continue to move it from block to block as I quilt. As much as I'd love to stick around and chat, I've got to get to work. Thank you again for your kind words regarding the cheater fabric and especially for the votes! I would like to enter another Spoonflower contest, but I've set the standard a little high for myself after winning the first one I entered. I'm overloaded at the moment with work projects and I'm working against a tight deadline, so real work is having to take precedence this week over the fun stuff. I really want to do some more fun designs now! Congratulations! How exciting to win with your first entry. I look forward to seeing more fabric designs from you! congrats!! I was so excited when I got the e-mail from spoonflower and as soon as saw the e-mail, I was like, "Hey I know that print!" Congrats again!! Well I can certainly believe it! Of course you won with that fabulous design of yours - way to go!! I just got my spoonflower newsletter and saw you won! Had to pop over to say Congrats! I love your design and will definitely buy some when you get it in your shop!! Love the colors you used. Find some time to design some more...you obviously have a knack for it! HOORAY!!! Congratulations to you. And the paintbox quilt looks fab. I can certainly believe you won. 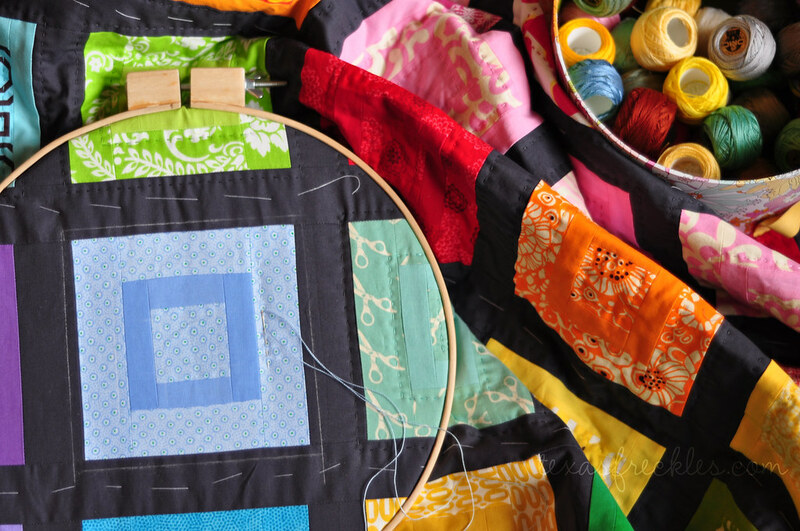 That fabric is so gorgeous, and you can't tell that it is a cheater's quilt either. Congrats on winning! I knew you would! I'll be looking forward to buying this fabric from you! so awesome and I just went and ordered 2yrds of this awesome fabric! It so reminds me of Flea Market Fancy and I have never purchased any of that, but I had to have this. Great Job! Your quilt is amazing. Very nice fabric composition. 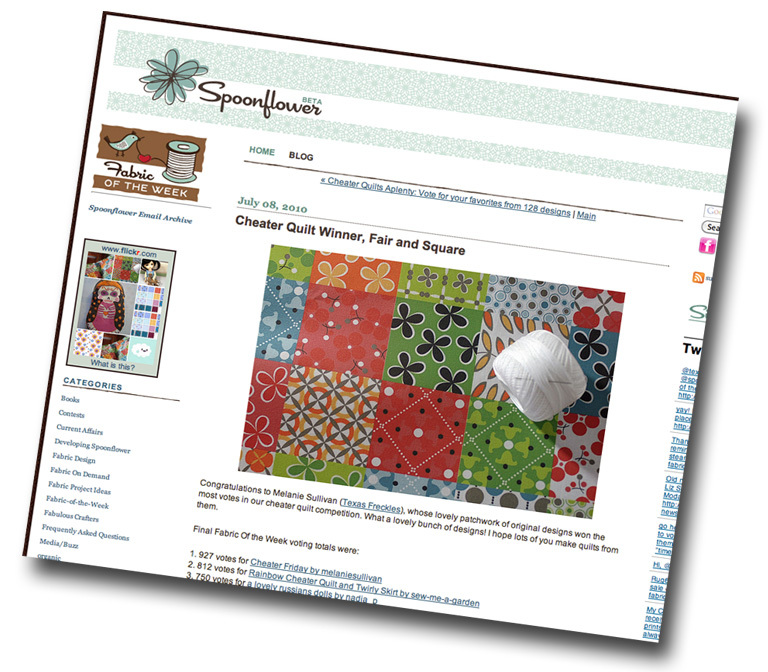 Hi there, your Spoonflower win led me to this website - how wonderfully creative you are! Looking forward to making myself a "cheaters" quilt with your wonderful fabric. :) Congrats! Congratulations! You really deserved it; for the first time in my life, I found a cheater fabric that I love thanks to you! How awesome! Congratulations on the win, it definately got my vote! Looking forward to seeing the variety of creations that come from it as well. Congrats on winning! It was well deserved! Keep us updated about when you start selling your fabric! Congratulations! I can't wait to order my fat quarter! Of COURSE I can believe you won! I can't wait to order the fabric but I WILL wait until I can get it from you, because of course you should be the one profiting from your great design! Congratulations! You're gong to need to order a bunch - we'll all want our own FQs of your cool design. OHHH Yay...I a soooo thrilled you won! I voted like crazy and was sure you were going to win because your design was leagues better than the rest! And yes, I will definitely be buying that fabric (after we come back from our long summer vacation)!! Way to go! Well deserved! Congrats!! It really is quite lovely! yay! i voted for ya- it is great- i love all the bold designs and colors! can't wait to see it in real-life! I voted for your fabric! I absolutely love it, and it may just have to be one of my first purchases of Spoonflower fabrics! Let me know if you do end up selling some of it yourself. I ordered a yard... I was excited to see you won. Great stuff...maybe this is a new career path. I was not surprised at all that you won. Yours is brilliant.Yes, I looked at every single entry and some other were very nice but yours was very, very, very nice. I look forward to getting a FQ when you sell it. Get a bit cause I think you are going to be swamped. Congrats!!! Congratulations!! How exciting for you! Can't wait to make a purchase! woo hoo congrats!! I voted and totally knew you'd win! Such a cute design! Congratulations Melanie! I'm so glad you've decided to sell some of your fabric, I'd love a FQ but I'll wait until you have it yourself. I think you have great potential to be a fabric designer! Yes, I can totally believe you won! Congratulations! How fabulous! You must be flying high today. I would definitely like to order a FQ, but will wait until you have it available. Well done! I am so excited for you!! Congratulation!! Can't wait to see the actual fabric! Yes! I can believe it! Congratulations :) How fantastic! Yay! congrats on winning, I'll keep my eyes out for when/if you sell the fabric yourself. I can totally believe it! Well done! I think buying from you sounds like a win-win - and I'd prefer to wait until you've seen it too so that I know it's as you'd intended. FANTASTIC, congratulations on your well deserved win! I love your blog! I'm a fan! Oh I just have to say congratulations Melanie. That is so awesome you won the cheater quilt fabric contest. Yours REALLY was the best!!! Congratulations on winning! Your design deserved to win! I'm doing my first hand quilted project (I generally machine quilt) and I wish I was as talented as you. Your quilting is lovely. This is *the* best cheater print I have ever seen. I'm going to have to get some! I love everything about it. Nice job!! Congrats! I knew you had it! I am looking forward to many little hexy's in my future as soon as you have your fabric avaiable.Yeah! SO pleased you won!! Well done, you must be so chuffed! Of course we all win really as now we get a chance to purchase your amazing fabric! I will wait until you approve the proof first. Congrats! You deserved to win as yours really was the most lovely. Well done Melanie I'm so glad that you won. I'm all for buying your fabric as soon as you are selling it. I will be on the look out for when you have it for sale. CONGRATULATIONS! I'm so belated in my wishes - sorry! Your design is so wonderful, and the win is well-deserved. Congratulations! It's lovely fabric, well done. Your designs are beautiful, and deserve to win. I will look forward to coming back to your blog to see the fabric you have available.